It occured to us that it was time to head out on a "road trip" but where? 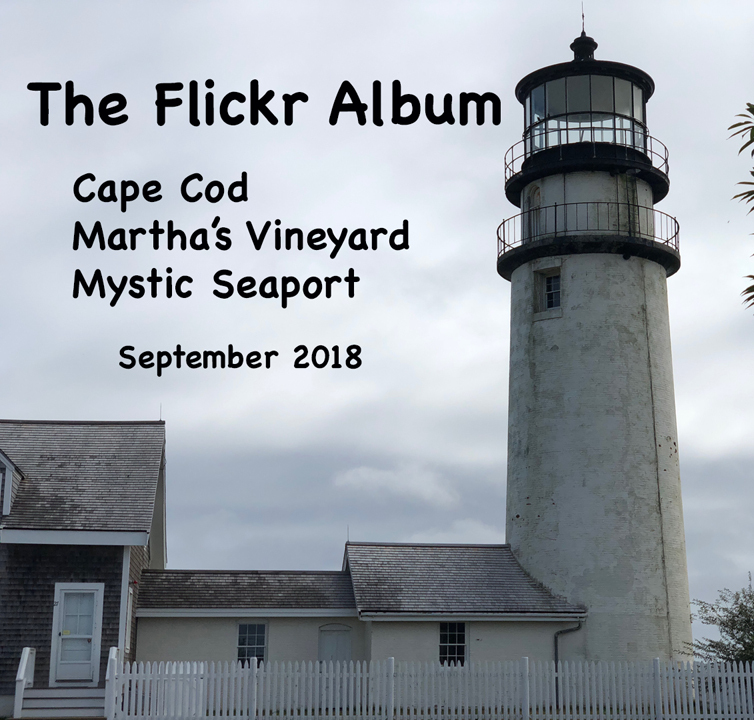 We were born and raised in Connecticut but had never ventured to Cape Cod and certainly not to Martha's Vineyard. Some dates were nailed down for September 2018 and the process of booking some rooms and a ferry boat was started. The big drive was going from Pennsylvania directly to Provincetown at the end of Cape Cod, a 10 hour (give or take) drive. 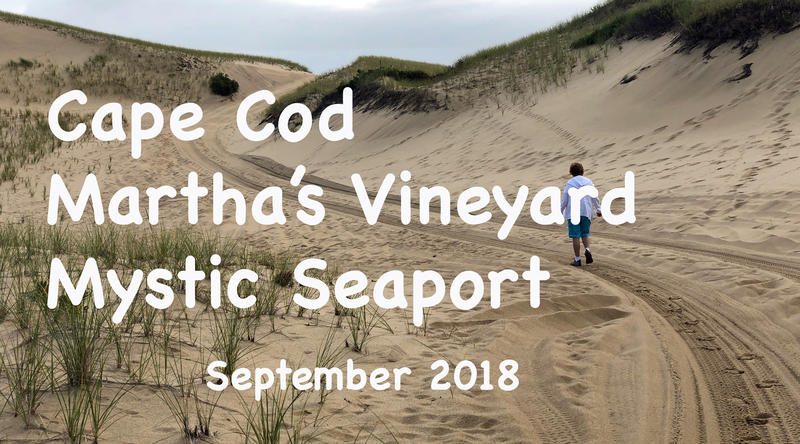 We stayed in Provincetown for a couple nights (one full day) then headed to Woods Hole for the ferry to Martha's Vineyard where we also spent a couple nights (one full day). Our return trip off the island was on a Thursday afternoon so we headed to the Mystic area for one night. Friday until early afternoon was spent at Mystic Seaport. Not documented in our pictures was a Friday evening meeting in central Connecticut with a half-sister that we've never met. How that came about is another story. Anyway, following dinner, we spent the night in a nearby hotel and headed home to Pennsylvania on Saturday. We spent a couple nights in Provincetown at an inn that was walking distance to everything of interest. We climbed the Pilgrim Monument, had some malassadas at a Portuguese Bakery, sampled some Portuguese rice at another place and basicallly walked our butts off. On the way out of town, we hiked among some sand dunes and visited the Highland Light. We arrived at Woods Hole a bit early for our ferry appointment but got across just in time for lunch. We parked in Vineyard Haven, walked around, had lunch then headed over to Edgartown where our rental cottage was located. The size of the island surprised us. The cottage was very nice and had everything we would need for cooking so we headed back into town for supplies. Breakfast and dinner was at the cottage which saved us a few dollars. For our full day, we headed to the farthest point and visited the Gay Head Light. In addition, we walked along a couple beaches, visited an Alpaca Farm, and walked around Edgartown. Once off the island, we headed to the Mystic Connecticut area for the night and, the next day, spent some time at Mystic Seaport. We even visited the historic Mystic Bridge before heading to our dinner date in central Connecticut. Clicking on this image will get you a 3-1/2 minute video summary of the road trip.